The New Town Trail was developed by Irvine Development Corporation as part of their major redevelopment of the town when Irvine was declared a ‘New Town’ by the government. 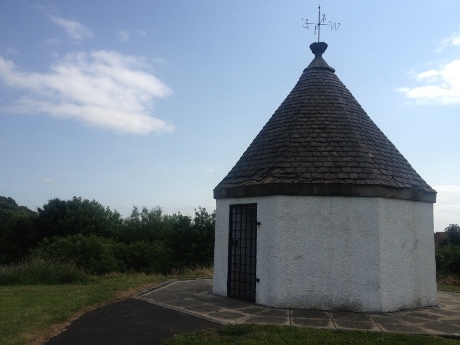 You can start the New Town Trail at any point along the route, however we would recommend starting the trail at the Low Green as this area makes a great location to have a picnic before or after your cycle. 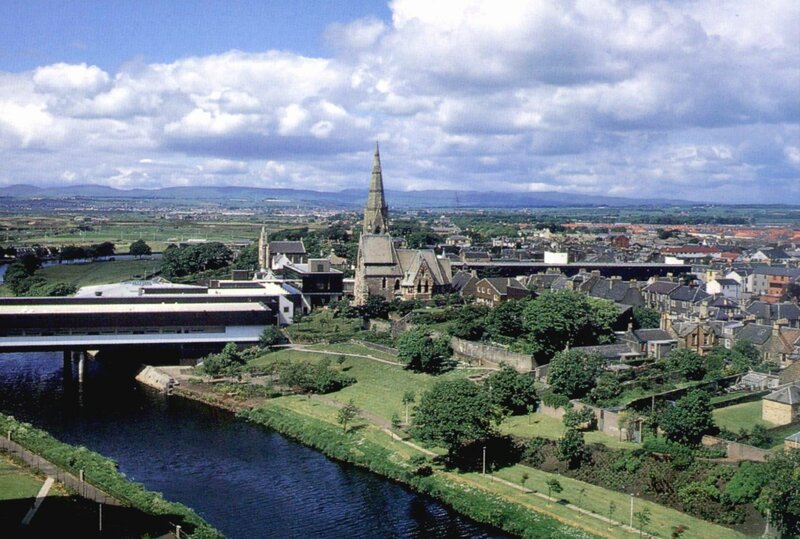 The path runs along the edge of the River Irvine and when you are ready to start the route you should follow head along the banks of the Irvine, away from the town towards Irvine Moor. As you leave the Low Green you will pass under the Marress Road and head up the slopping path onto Irvine Moor. As you follow the path keep bearing left on the foot paths to stay as close to the River Irvine as possible. 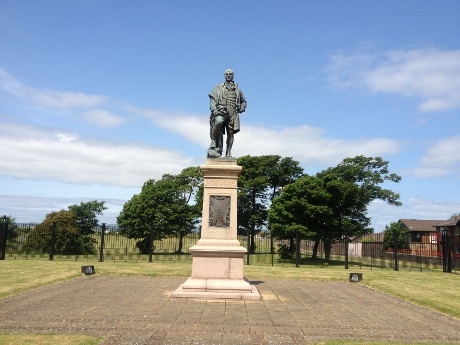 You will shortly pass the Burns Statue on your right hand side. As the path starts to to bend to the left, following the river you will see the Irvine’s hold horse racing course. This course is still used during the Marymass Festival that takes place during August each year in Irvine, though the racecourse building and facilities were removed many years ago. Follow the path as it leaves the river banks and starts to follow the railway track. This track is the main train route between Glasgow and Ayr and during peak times will have trains running along the line every 30 minutes. 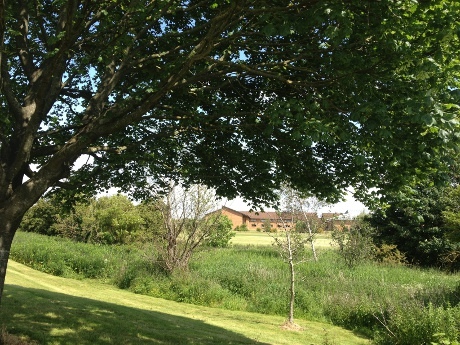 The path will take you past Irvine Golf club and towards the site of Ravenspark Hospital. Much of the old Ravenspark Hospital has been demolished, and the site is currently being redeveloped as a housing estate. The old gate house cottage fronts are being preserved as part of the housing development and plans show the old clock tower will sit in the centre of the new housing development. The site was at the centre of some recent controversy when an unmarked mass grave was found when the developers started to work in the area. Follow the path past the old site of Ravenspark Hospital and past the recycle centre. This road is fairly quiet, however the speed limit on the road is currently 60mph, so caution should be taken. After crossing a bridge that crosses the River Garnnock follow the cycle path which heads off to the right of the road. This path will take you under the busy dual carriageway and into the town of Kilwinning which neighbours Irvine. Continue along this path until you reach a foot bridge that crosses the river. Cross the bridge and follow the path until you reach the main road (A737). When you reach the A737 take a right turn and follow the road a short distance until you reach the entrance to Eglington Park. Once in the grounds of Eglinton Country Park follow the signs towards the visitors centre. This location has alot of information about the history of the Eglinton Estate, a popular café, play parks and toilets. When you are ready to leave Eglinton Park follow the signs towards Eglinton Castle Ruins. From the castle take the path towards the river banks and then follow the paths along the river banks, heading in the opposite direction from the visitors centre and castle. There are many paths within Eglington park, however if you stay on the same side of river as the castle and continue to follow the paths away from the visitors centre you would end up at close to a round-a-about on Cairnmount Road in Irvine. A good point of reference when using the paths within Eglington park is the Standing Stones, these site on top of a small hill and can be seen from many parts of Eglinton Park. You want to head past these towards Cairnmount Road. The Standing Stones don’t have any significant history, these were added to the mark in the last 30 years. Once you have reached these follow the paths towards the round-a-about at the top of Cairnmount Road. Cross the road and follow the path onto Lochlibo Road. Before you reach Lawthorn Primary School the path heads off to the left, follow this path. The path will take you around the back of the School and into a small country road. Continue straight on, passing the Lawthorn farm Restaurant on your right hand side. Cross the main road that runs along the front of Lawthorn Farm Restaurant and follow the path that sits directly opposite the junction. When you reach the junction in the road you will see a small row of cottages to your right. Take a left turn and cross the bridge across the Annick Water. Shortly after crossing the bridge you will see a road that has been closed off for motor vehicles. Take this road up the hill and follow this road until it ends. At the end of the road follow the path that sits directly opposite the junction when it’s safe to do so. You will now find yourself on Perceton Row which is a small country road that connects the Perceton area to Townerlands Road. This road runs between two (Broomlands & Bourtreehill) of the large housing estates that were created when Irvine was made a New Town back in the early 60’s. These were constructed has part of the plans to increase the population of Irvine to 120,000 residents and while the town never reached these levels the population as greatly increased. As you follow Perceton Row you will pass a few local farms and a small row of cottages which will site on your right hand side. At the end of the road follow the road that sits directly opposite the junction. Follow this path until you reach a function with a path leading off to your right. Take this path and follow it into the Annick Valley Park. Continue along this path which will lead you along the outskirts of a small town called Deghorn, past a large secondary School called Greenwood Academy and will for the most part follow the banks of the Annick Water river until you reach the Menzies Hotel. At the Menzies Hotel cross the road at the pedestrian crossing and follow the path as it continues to follow the river. When you reach a cross roads in the paths go straight on, towards the next pedestrian crossing. Cross the road when it’s safe to do so and take a left turn towards a blue arched bridge. Before you reach the bridge a public path will head off to the right hand side. Take this path and follow it along the banks of the River Irvine until you reach the a pedestrian bridge that sites at the edge of a public park known locally as the Golffields. When you reach the foot bridge use this to cross the river and follow the path along the river banks, passing four blocks of high rise flats on your left hand side. As you make your way along the banks of the River Irvine you will come to the Rivergate Shopping Centre. This is the largest shopping centre in North Ayrshire and spans the River Irvine. This shopping centre was built on the site of the Old Stone Bridge that used to link Irvine Town Centre to the harbour area of the town. Continue under the shopping centre and along the paths that following the river until this comes to an end. Leaving the path continue to follow the river along Waterside until you reach the green bridge. This bridge crosses the river back into the Low Green, which is the area this route began.